Wonder Play is for infants through kindergarten age children. Children 3 years old and older join the younger children in the classroom after the “story for all ages” with the adults in the sanctuary. 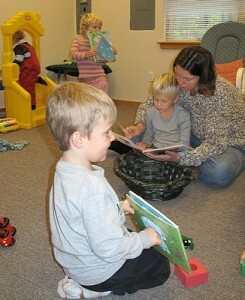 The morning consists of circle time, which includes a song, chalice lighting, joys and concerns, and a story. The children are then invited to choose a work activity such as reenacting the story, art, books, decorating the chalice table, or a special project. The morning ends with a teatime and closing. Spirit Play is for 1st through 5th grade students. Through song and story, children are introduced to these UU principles: Respect all people; Offer fair and kind treatment; Yearn to learn; Grow by exploring ideas; Believe in our ideas and act on them; Insist on peace, freedom and justice; and Value nature’s web of life. 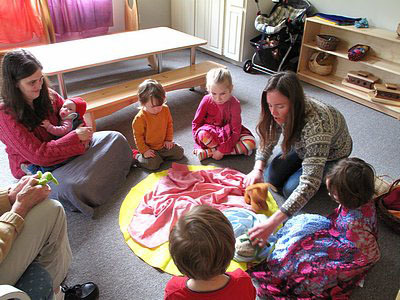 Children are given opportunities to explore these ideas through independent and group work activities. grade through high school students. This program is structured using the UUA-published book Neighboring Faiths: Exploring Religions with Junior High Youth, authored by Christine F. Reed and Patricia Hoertdoerfer. As UU’s we promote a free and responsible search for truth and meaning. We are called to draw upon the wisdom from the world’s religions to inspire us in our spiritual life. We need to learn about other faith traditions in order to be open and understanding of other people. We believe there are many paths each of us can choose to follow; therefore, we owe it to ourselves to learn about the different paths. This curriculum offers flexible sessions to explore history and development of different faith traditions. The youth plan their own program by choosing which religious groups to learn about, visit and relate to their own growing faith. This will include visiting other faiths, creating worship experiences and more. 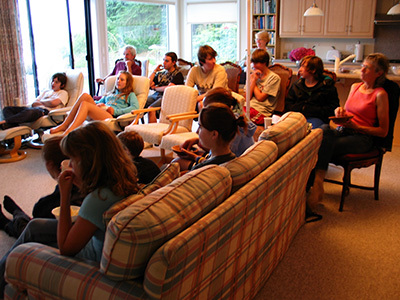 In addition, occasional midweek social activities, such as movie night (shown in the photo) or bowling are arranged for youth. Lives not only provides facts about anatomy and also helps participants clarify their values, build understand the spiritual, emotional, and social class is open to 7th and 8th grade students. A fee is charged to cover the costs of training facilitators, meals/ snacks, and a parent orientation. 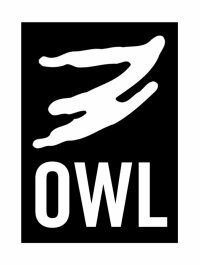 Our next OWL program is scheduled for Fall 2016. Please contact our Director of Religious Education, for more information or to sign up. You can also find more information about the course here.